My son wants to save up for something with his allowance and chore money, which we do on a point system. When he saves up 100 points he will have enough saved up, so we made 100 thin rings so he can visually track how close he is to his goal. 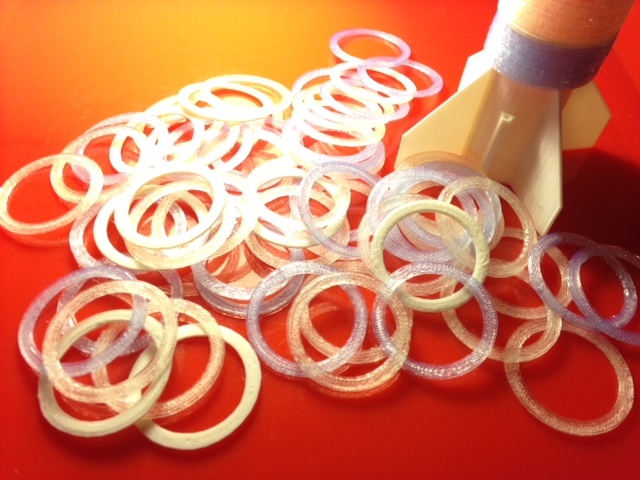 This is the real reason we printed the rocket yesterday; the rings are sized to fit around the rocket and so that 100 rings fill up the rocket length entirely. Settings: MakerBot "low" can print 15 of these rings in 30 minutes. Technical notes: The vertical space we wanted to fill on the rocket was 170 mm, so we needed each ring to take up 1.7 mm of space. Making them each 1.7 mm tall did *not* do this. Surprisingly, due to the resolution we were printing with and the fact that the rings don't sit exactly flush with each other, we had to cut these rings all the way down to 1.1 mm tall in order to get 100 of them to fill up 170 mm of vertical space.